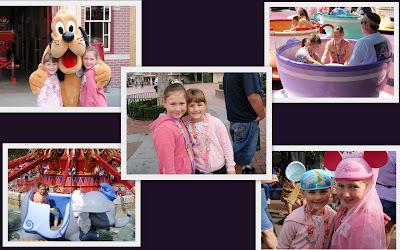 We've been home or almost two weeks and I'm finally getting around to posting a few of our pics from Disneyland. We had so much fun and it will be a vacation to remember for sure. I'm so glad my niece Kolbi was able to go to Disneyland with us. She's a special little girl. We arrived at Disneyland on Wednesday evening. 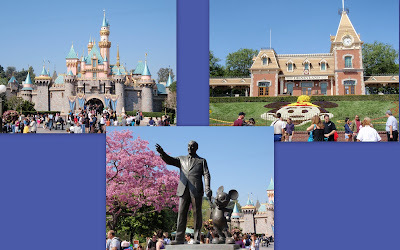 We checked into the Disneyland Hotel and headed for Downtown Disney to grab a bite to eat and just check it out. We ate on the patio at the Rain Forrest Cafe. The food was great as always and the girls had so much fun just laughing and being girls. After we ate we decided to check out some of the stores. They had a Build A Bear and Kolbi had never been so in we went. Alyssa showed Kolbi how it all worked and Kolbi made a Golden Retriever and named her Bell. She also got Belle's yellow gown from Beauty & The Beast to dress her dog in. Alyssa got a bunny rabbit and named her Kolbi...hehe...she got the Snow White outfit and we got done just as the store was closing. We went back to the hotel and got a good night sleep as we knew Thursday would be a long day at Disneyland. We got up early and was at the gate to enter Disney at 9am. We purchased lanyards for the girls and some trading pins to trade with the Disney cast members. Alyssa was amazed and thought Disneyland was so cool. Most of the ride wait times were less that 30 minutes which made for a very enjoyable day at Disneyland. We rode all of the rides we'd marked with Splash Mountain being the next to last ride. We waited the longest for Splash Mountain and Kolbi & I got the front of the log. I was not too excited about this ride as I knew there was a chance we'd get wet. Well, wet is an understatement. I had to ride in the VERY front...and when we got off the ride I didn't have one square inch of my clothes that wasn't wet...Kolbi too. We were both WET RATS. We decided it was time to head back to the hotel but decided we could squeeze in one last ride....so we rode the Jungle Ride as it only had a 10 minute wait time. Throughout the day, the girls traded pins all through the park with the cast members always hunting for Hidden Mickey pins . We were all EXHAUSTED and slept like babies. We didn't get up quit as early on Friday but still made it over to California Adventure Park by 10 am. We really enjoyed the park and our favorite ride was California Screamin'...a FAST and smooth roller coaster that I could have rode a dozen times and not gotten tired of it. I was worried Alyssa would chicken out as the roller coaster had a loop and Alyssa was not so sure about going upside down. SHE LOVE IT!!!!! 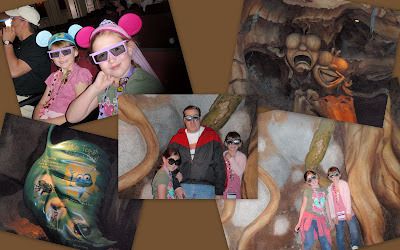 Another fun thing we did at California Adventure Park was go to the Bugs Live 3D show. It was so cool and I actually think it's considered a 4D show as it included our sense of touch and smell. We were squirted with water and the stink bug blew a big stinky at us....and it smelled just like a real stink bug. How did they do that?? I hope we will be able to take Alyssa back to Disneyland or even Disney World again soon. It was the best vacation ever.